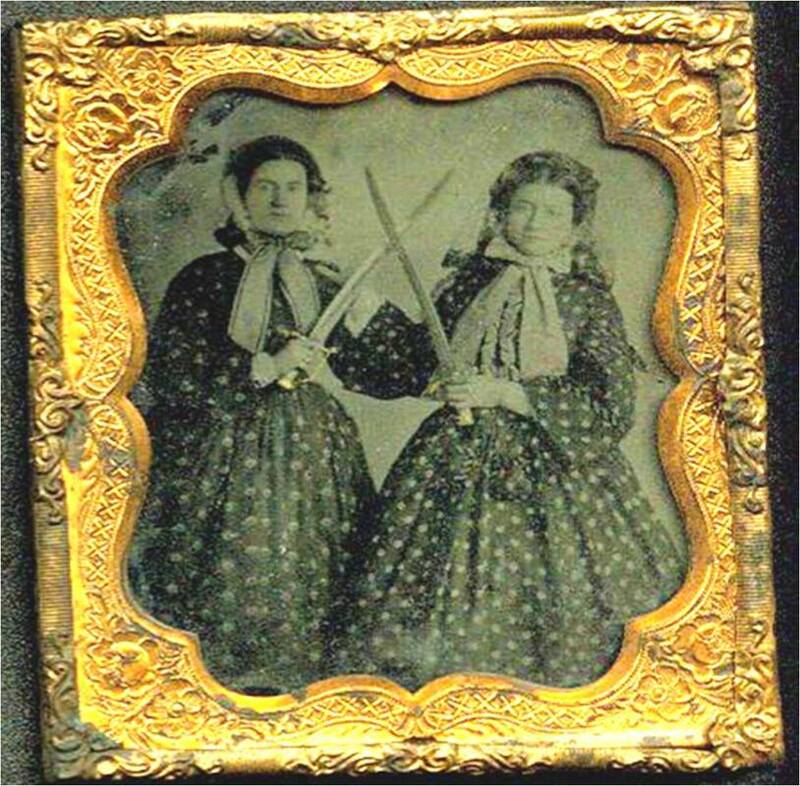 "This first is a tintype of two women who posed for their photograph with Enfield bayonets. I interpret this photo as being representative of the moral, social, and psychological support of women for the war. 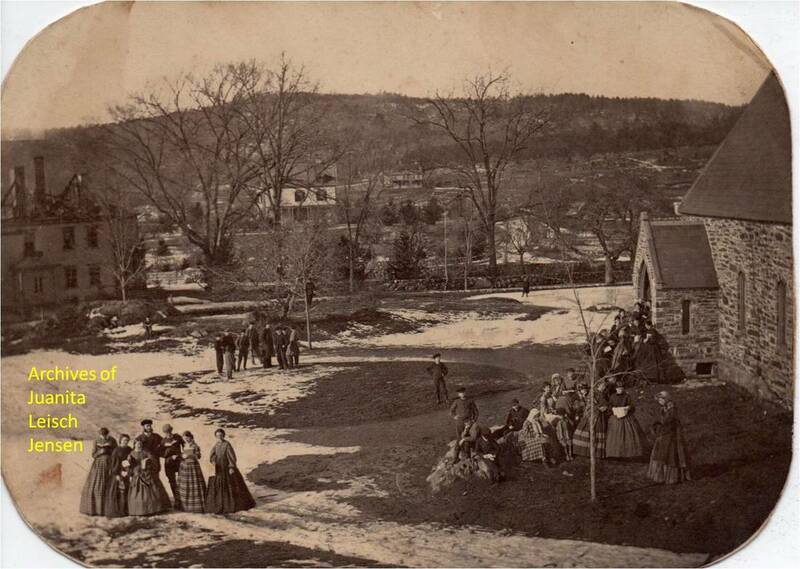 This second is an albumen print of a group of workers posed in front of the Washington Arsenal. 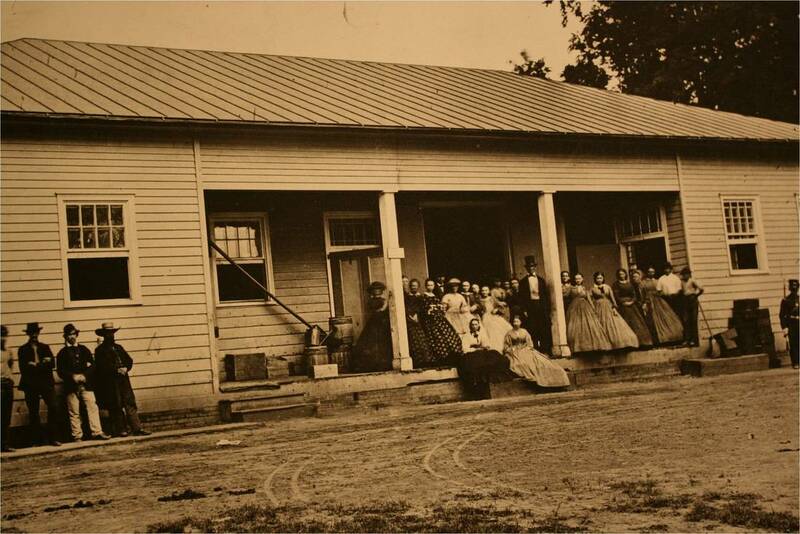 Nearly two dozen individuals died in an explosion at this facility in June, 1864. They, and tens of thousands of other civilians worked in manufacturing facilities like or in their own homes during the war producing the food, shelter (tentage) clothing (uniforms), arms and ammunition (like this facility) that was absolutely essential to soldiers. This photo is often cropped to exclude the men at the left, but they are part of the story, too. 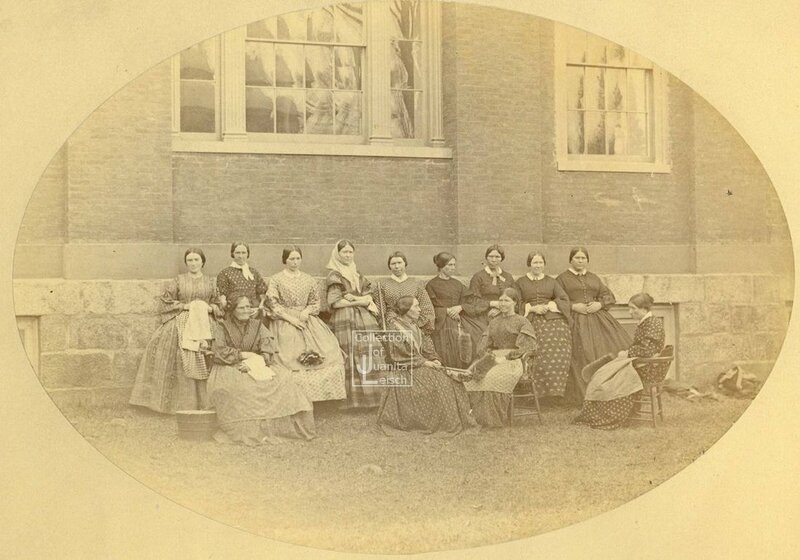 The third is a group of women with needlework/sewing projects. Millions of women ‘fought with needles’ of various sorts, providing soldiers with uniforms, socks, and other necessities." ​Again, I thank our author for providing us with supplementary narrative and imagery. 1. What is it that determines – or should determine -- whether a civilian’s particular role in the Civil War was important? 2. What information from this Civilian Influence on the Military do you think would be most important to share with our military reenactor friends? 3. What information from this chapter was most useful for you? Why? Please post your comments within a week, so we have the following week to make responses. Please read Chapter IV: Civilian Participation in the War by March 15th and return on that day for the next installment of this exciting discussion. Chapter two dealt with day-to-day life events. We might have read this information and reflected upon our own lives. You are an expert in modern American society, you live it everyday. Making modern connections to Civil War civilians is a great way to hook a crowd. Folks will be more interested to engage you in a topic if you show them how Civil War civilians were similar to them. Chapter II also talked about how the nation was an agrarian society. Because of this, I've included some videos for you to watch. These Civil War Digital Digest videos talk about farm tools. It would be good for us to have some information about harvesting since the society was agrarian. Enjoy. The image above comes from the collection of Juanita Leisch. She said "Here is photo of domestics at Harvard, one of photos taken for Year Book inclusion." You can see how the staff dressed, presented themselves, and included their tools of the trade for the picture. 1. What information could use from this chapter to make a connection with a spectator at an event? How would you use it? 2. What sources of information would be best for providing more information on 1860's professions/trades? 3. What other connections can you make between contemporary society and Civil War society? Please post your comments within a week, so we have the following week to make responses. Please read Chapter III: Civilian Influences in the Military by March 1st and return on that day for the next installment of this exciting discussion. It's a photo that really wants to tell a story. If you look at the left, that building looks like it's had a recent fire.... you can see the rafters. Everybody is standing outside. There's snow, but few people have coats . Some people (mainly girls) have books and a couple are trying to read. Some people (mainly boys) are celebrating their freedom, and a couple have climbed trees. Many people are huddled near what appears to be a church door. There is a Historical Society in Waltham, and I am hoping that by contacting them I might get 'the rest of the story'." Many thanks to Mrs. Leisch for all of the work which she has done for the book and for working with this study group. As you can see, Mrs. Leisch has provided us with supplementary material and will work with me to form assignments for the book study. 1. What information stood out, or surprised you, in Chapter I? 2. What sources of information would be best for providing more information on these topics? 3. Look at the image above. How can you use it to grow your knowledge of Civil War civilians? Please post your comments within a week, so we have the following week to make responses. Please read Chapter II: Everyday Life in America by February 15th and return on that day for the next installment of this exciting discussion. Welcome to the Book Study! This blog is an interactive book study researching American civilians during their Civil War. The intent is to increase knowledge among readers through an introductory course of study of An Introduction to Civil War Civilians by Juanita Leisch. The course will provide primary sources not found in the text and will encourage readers to explore additional information to share with the cohort. Readers are encouraged to participate at their comfort level and to understand that this is an introductory level book. Leisch, Juanita. An introduction to Civil War Civilians. Gettysburg, PA: Thomas Publications, 1994. ISBN 9780939631704. The class will begin February 1st, so check back then to see the assignment. ​I will facilitate the conversation by posing questions for each reading assignment. We are all here to learn and share knowledge so that we can provide more authentic information to the public. Don't be afraid to ask questions! Please introduce yourself in the comments below. 2. What is your living history experience? ​Me: I'm Den Bolda. I'm a teacher and co-mentor for a high school History Club. I'm a father of three boys who have special needs and are all one year old. We were chosen to adopt twins from the Three Affiliated Tribes of North Dakota (They are Hidatsa), and found out we were pregnant two weeks later! I've been reenacting since 1993 and have done military, militia, and civilian impressions for Roman, French & Indian War, Revolutionary War, American Civil War, and World War Two. I'm a part of this book study because I want to learn more about my real life career during the Civil War and the everyday life of people during that time.